MONTREAL - A split has emerged in the Harper government over a fundamental principle: the rules governing the potential breakup of Canada. The Conservatives' senior Quebec minister has declared in two media interviews today that a 50-per-cent-plus-one vote for separation is enough for a province to secede. That comment by Denis Lebel flies in the face of longstanding federal policy under the Clarity Act, which declares that the federal Parliament would require a clear referendum question and clear result before negotiating secession conditions with any province. It also comes after the Conservative government has repeatedly scolded the opposition NDP — with its heavy contingent of Quebec MPs — for being wishy-washy on the Clarity Act. The NDP gleefully circulated transcripts of Lebel's remarks in a TV and radio interview. In those interviews, Lebel was being asked about a court case over secession rules in which the feds are siding against the Quebec government. A Montreal radio host repeatedly asked Lebel, who was trying to change the subject, whether as a Quebecer he believed 50 per cent plus one was enough. Finally, Lebel bit at one point, when he was asked whether he considered 50 per cent plus one "clear" enough: "We've always said we'd leave that to Quebecers but, yes, it is for me," he said. "The Government of Canada has a responsibility there to defend the rights of Canadians. And for sure, I'm a Quebecer who wants to work with Quebec, but I knew right off the bat that the Marois government would use this file to advance her 'sovereigntist governance' strategy. "It's not necessarily great timing — the week where we deliver a throne speech everyone liked, and we signed a deal (on free trade with Europe) that we believe will mark history." He later repeated the remark in a TV interview with former politician Mario Dumont. Lebel told Dumont that he was "comfortable" with the 50-per-cent-plus-one standard. The Prime Minister's Office offered a curt response when asked about its position on 50-per-cent-plus-one, and whether Lebel should resign from cabinet if he disagreed. "The position of the Federal Government is reflected in the factum submitted to the court last week," said an email from Stephen Harper's office. The province's Parti Quebecois government quickly pointed out the glaring contradiction in federal policy. The PQ is believed to be mulling an election call for Dec. 9 and pundits in Quebec have suggested the court case, in which federal lawyers are siding with Anglo-rights activists against the PQ, could prove to be an electoral godsend to the pro-independence party. However, support for independence is low and the PQ usually avoids drawing attention to referendum talk during an election campaign. In fact, in the last election where the Clarity Act was a major issue, the sovereigntist side suffered at the polls. In 2000, the Bloc Quebecois lost six seats. The election result was so disappointing to sovereigntists that, weeks later, Lucien Bouchard resigned as premier and declared that he'd failed to revive the independence cause. "I accept my share of the blame for failing to rekindle the flame and to impress upon our fellow citizens the gravity of the situation," Bouchard said in a solemn farewell address in January 2001. "(Quebec voters) remained stunningly impassive despite federal offences." 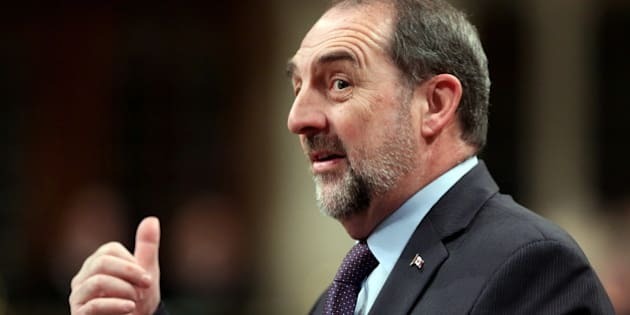 This is now the second time in just over a month that Lebel finds himself squeezed between his cabinet colleagues and Quebec nationalist viewpoints. In September, he said there was nothing that upset him in the PQ's religious-clothing plan — which has raised the ire of some other cabinet colleagues. He later added that, because the so-called values charter has not been tabled in the legislature yet, there are no specific details to get exercised over. The PQ has signalled that it could be planning to mount an election campaign with identity as a central theme. The party's opponents, meanwhile, suggest it's only a diversionary tactic to make voters forget a lacklustre economy. The comments from Lebel prompted a torrent of reaction from other parties. "Canadians don't want their leaders to play games with national unity," said Liberal Leader Justin Trudeau. "They want leaders to be clear, principled and consistent."